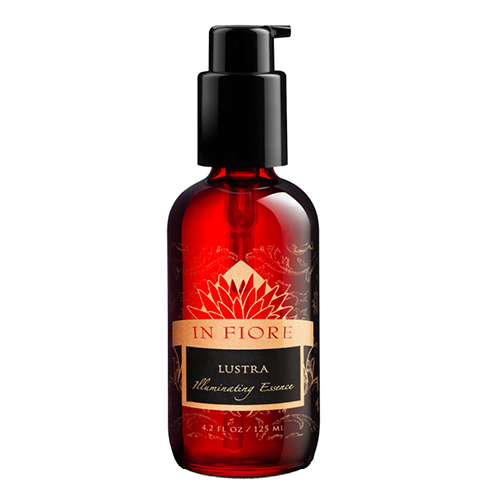 Lustra Illuminating Cleansing Essence by In Fiore takes oil cleansing to new heights. A completely unique combination of nourishing oils work in concert to deeply purify while keeping the skin's pH in balance. With its gorgeous scent of bergamot, rosemary, jasmine and cypress, Lustra turns your nightly cleanse into a gorgeous facial massage ritual. A unique combination of super skin loving avocado, sunflower, grape, jojoba and castor seed oils are blended in a perfect formulation to make this the supreme standard in oil cleansing. Healing arnica montana works holistically to heal skin and increase circulation. Lustra can be massaged into skin dry, and on top of makeup, as an oil cleanser and is also step 1 in In Fiore's 4-2-4 Cleansing Ritual. Apply 2-3 pumps of Lustra into palms and gently massage into face and neck for up to 4 minutes. Layer with In Fiore's Treate Cleansing Emulsion and massage for an additional 2 minutes for a completely transformative deep cleansing. To complete the 4-2-4 ritual, finish with a 4 minute rinse – gently splashing skin to remove the cleanser for 2 minutes with warm water followed by 2 minutes of cool water. First, I should say that I went back and forth on whether to purchase Lustra and Treate and try the 424 method. It seemed like a large investment of both money and time and I was on the fence. I finally decided to give the 424 method a try and I'm so glad I did! Everything I've read about both products is spot on– the scent, the beautiful textures and the end result. After finishing this deep cleanse, my skin looked amazing– smooth, clear and hydrated. My skin actually looked like I had just gone for a facial. I view this cleanse as a form of meditation and a way to slow down in the late evening. I can't recommend these products and the 424 method enough and will definitely be incorporating it into my routine as much as possible.